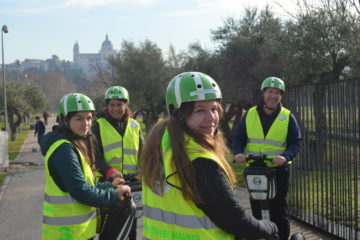 Segway Travel Madrid - Segway Tours Madrid - Madrid on segway. 15€ RESERVE YOUR OFFER !!! 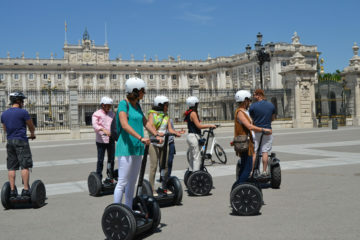 Segway Madrid is the easiest and most convenient way to discover and kick the city. It is possible that your stay in Madrid is not of the duration you need to soak up its museums, monuments and streets. 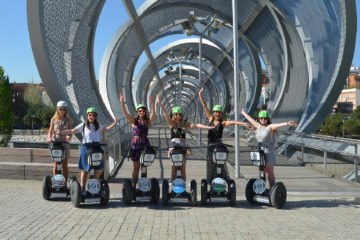 For this reason the excursions on segway Madrid have emerged. The most important cultural, tourist and gastronomic areas are covered with different segway routes through Madrid , it is easy in a day to approach the customs and roots of the capital with some of its routes. The simplicity of operation and its security make segway Madrid an adequate transport to walk through both the urban areas of the city and the countryside to enjoy nature and stunning views of the city. There are different routes to travel Madrid on segway , from Madrid de los Austrias, the letter district, Palacio Real to a country house or retreat among others, so discovering each area of ​​Madrid on a segway is very easy. Each route on a Madrid Segway is guided by what takes much time. Our tour guides are very knowledgeable about Madrid and its history, which will make your Segway trip to Madrid the most profitable. As experts they know where they can see the best sunset or the best time to make a stop or visit making your trip one of those moments to remember your trip. If you have any curiosity, do not hesitate to ask them, they are lovers of Madrid and they love to make their city known. If you want to visit more than one area on a segway, you may talk with your guide to make a tour of Madrid to suit you on a segway . Security is a maxim when it comes to making a guided tour on a segway through Madrid , the segways are updated every so often and are checked every day so that they are always ready for the trip . The speed that reaches is enough to enjoy the ride contemplating everything that Madrid offers us without losing security. It is advisable to wear a helmet as a preventive measure, avoid possible dislikes, we will all be more secure and enjoy the trip more. If you are demanding, traveler and dynamic in your visit to Madrid, you can not fail to try one of our Madrid segway routes . Why Choose Segway Travel Madrid? 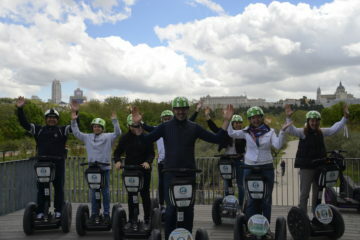 Segway Madrid tours are designed to discover and Enjoy Madrid in a different way. Cover the important sights of Madrid while experiencing a futuristic mode of transportation. Get the latest way to advertise your product or services through Segway. The futuristic machine captures the attention of potential customers wherever it goes and its size enables it to have exceptional mobility, easy to learn, easy to use. We are located in the heart of Madrid with a venue close to the touristic sights along with a training room within our center for utmost safety. Reserve your tour now through email, telephone or whatsapp and have a unique experience with us. The best experience I had my partner and I in Madrid in a professional, friendly and fun atmosphere. We took the two hour tour and were able to see and appreciate Madrid in a complete and fun way. Fernando was an exceptional guide in every way, in the information provided in each place we went and his genuine interest in seeing Madrid, Thank you for your good treatment and for giving us this unique experience, It will be until next time. My friend and I met Fernando, one of the owners, outside the palace whilst he was leading another tour. Despite being busy he was more than happy to speak to us and let us try out the Segways, which lead to us booking in for a slot an hour later. We met him at his very central office (near Opera metro) at half 6, and after ensuring we could control the Segway’s safely, we left for an hour tour around Madrid. Fernando let us choose where we wanted to visit which made the experience even more fun and personal, and he also took professional photos throughout the tour which he emailed to us afterwards at no added cost. The whole experience was extremely fun, and well worth the €25. I was in a party of 9 guys and the tour felt personal and tailored to our needs.We were met by our tour guide Mauricio who was waiting on a segway in opera square, and he took us on a short walk to their office where we were quickly set up on our segways after payment and a short safety briefing. Mauricio gave us multiple destinations to cover in the hour and we eventually settled on the palace/cathedral, the temple of debod and plaza de Espana/gran vía.The tour was fun and very informative and most importantly very relaxed. If 25 euros seems steep for an hour on a segway, i can tell you afterwards it will feel like a bargain. The combination of the segway and quality tour in one of europe’s most vibrant cities really makes the whole thing an experience to remember! Before leaving, it is practiced in the premises with indications and tips to leave with full guarantee. Thank you Fernando !!! I treat you superatenly and kindly. Very closely. He was not wearing a coat and lent me a vest. Skateboard helmets that protect the neck. Press security at all times. We repeat for sure !!!! We are Segway. We are Travel. We are Madrid. An alternative tourism company in segway for travelers who want to know and feel Madrid in a unique and fun way.